Five years ago, chemists at Louisiana State University found that blood from the American alligator can successfully destroy 23 strains of bacteria – including strains known to be resistant to antibiotics – and significant amounts of HIV. 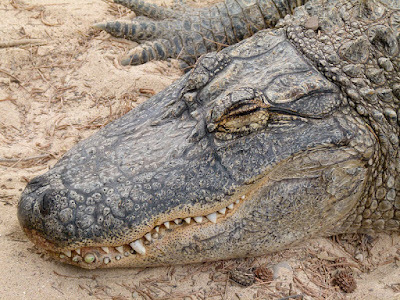 Now an international team of scientists is studying alligator jaws in hopes of applying the secrets of their tooth regeneration to people. Like us, alligators have a layer of epithelial cells called dental lamina, but unlike ours the stem cells within it grow new teeth repeatedly. They hope to identify the cellular and molecular mechanisms that will allow them to stimulate the growth of a replacement tooth when an adult tooth is lost. “Alligator teeth are implanted in sockets of the dental bone, like human teeth. They have 80 teeth, each of which can be replaced up to 50 times over their lifetime, making them the ideal model for comparison to human teeth,” explains team lead Ping Wu of the University of Southern California.